The Apostle Evodos is numbered among the Seventy Apostles and was consecrated by the Apostle Peter as the first bishop of Antioch. It is said that it was under his bishopric that the followers of Christ in Antioch first became known as "Christians" instead of Nazareans or Galileans. 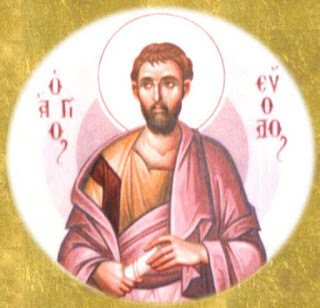 Hieromartyr Ignatius the God-Bearer, disciple of the holy Apostle John the Theologian, mentions him in his Letter to the Antiochians: "Remember your blessed father Evodius, who was made your first pastor by the Apostles." Tradition holds that St. Evodos was a fairly prolific author among first century christian writers. Unfortunately, as with many writings from the early Church, none of his writings have survived, which his biographers say was due to persecutions. Fortunately we do have information from the fourteenth century historian Nikephoros Kallistos Xanthopoulos regarding a book authored by the Apostle Evodos titled The Luminary (or The Star or The Beacon). "At the age of three she [Mary] was brought into the Temple of the Lord where she lived for eleven years. She was entrusted to Joseph by the priests, and when she had lived in his home for four months, she received the joyous annunciation from the angel. She then bore Christ, the Light of the World, in the fifteenth year of her life." Such traditions are usually thrown out by scholars and not considered, but as Orthodox Christians we know that our teachings are of apostolic origin and regarding these aspects of the life of the Theotokos we see here a clear testimony. 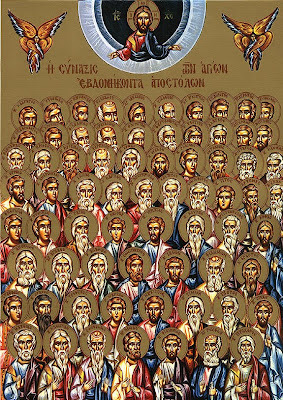 It only leaves one wondering what treasures all the lost writings of the Apostles and early Fathers held within them. It is believed St. Evodos died a martyrs death in 66 AD, however others maintain he reposed in peace. The feast of St. Evodos is celebrated with his fellow apostle Onesiphoros on September 7th.